Deteriorating rail infrastructure caused 13 Canadian National Railway tank cars to derail and explode in a fireball October 19, 2013 in Gainford, Alberta (Edmonton Journal). The Transportation Safety Board (TSB) of Canada recently released its investigative report on the accident that resulted in a local state of emergency and evacuation of 106 nearby homes. 138 people were evacuated for 4 days and one house was damaged by the intense heat. Four tank cars loaded with crude oil and 9 pressurized tank cars loaded with liquefied petroleum gas (propane) fell off CN’s mainline in a curved section of the tracks. Two of the propane tank cars broke open and caught fire, causing a huge explosion that lit up the night sky. A third tank car released propane from its safety valve, which ignited. TSB investigators found 16 transverse cracks in old rails, one of which actually split the track. The high (outside) rail in the track curve that broke was marked by visible surface cracks and chunks of rail falling out, said George Fowler, a TSB investigator. The track, made in the 1970s, was due for replacement. The low (inside) rail in the curve had been replaced in March 2013. The new rail sat taller than the old worn rail it replaced, which put more pressure and stress on the older high rail that also needed replacement. Replacing only the low rail “obviously…wasn’t the right decision based on the derailment” said Fowler. “Railroads are good businesses. They are not going to replace an asset before they have to”, Fowler continued. The TSB’s comments certainly highlight one of the main causes of derailments and other accidents, namely that railway corporations let their rail infrastructure deteriorate to the point where it falls apart. If regular and adequate safety monitoring and maintenance were conducted, the number of derailments would be significantly lower; however, adequate monitoring and maintenance cost money and time, which affects the bottom line of railway companies like Canadian National Railway. Transport Canada has also been repeatedly criticized by the TSB and rail safety experts for inadequate oversight of companies’ rail safety programs. In many cases, federal legislation already exists to address rail safety issues; unfortunately, the legislation is poorly enforced by the federal government. 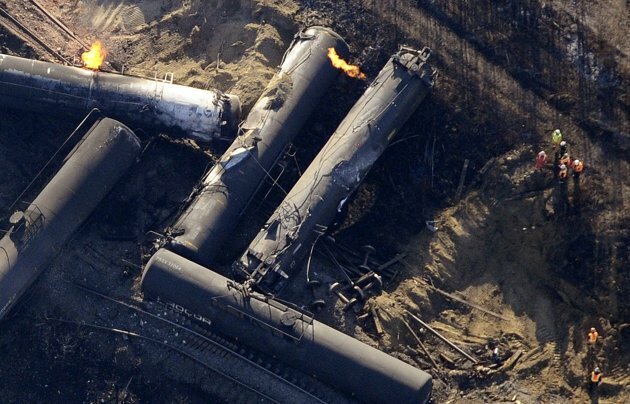 In other cases, new legislation is required to address shortfalls in rail safety measures. Read CN Railway Derailments, Other Accidents and Incidents for hundreds of additional examples of CN derailments, spills, explosions and fires. ~ by railroaded on March 1, 2015.